BetPhoenix is having a March Madness Sweet 16 Bracket Contest with 16 great prizes! Open to new and current BetPhoenix players. All accounts that have a deposit since November 1st, 2017 until February 4th, 2018 will receive 1 courtesy free entry. Additional entries will be awarded for every $200 deposited to your account, between February 5th, 2018 and March 21st, 2018 (midnight). Bracket entries must be received by March 21st, 2018 (midnight). Entries submitted after the cut off time will not be accepted. Players can earn additional entries with each qualifying deposit. The top 15 performers are prize eligible. The absolute worst performer is also prizing eligible. Places will be decided by both selection accuracy and time of entry submission. Clients may have multiple entries, but only under the same account number, and based on 1 free entry plus any entries resulting from deposits of $200 or more. Accounts with more than 1 winning entry will only get the higher prize awarded. Entry submission time is the tie-breaking factor where accuracy of selections is equal. The contestants winning our major prizes agree to allow our company to use their partial names for promotional marketing related purposes, and to submit pictures of their prizes once received. Entries will be graded and winners announced on our website on April 3rd, 2018. Winners will be contacted by our team in order to inform them about their prize. If for any reason, and after a period of a month, we were unable to reach them through the available contact means, he/she will be forfeiting said prizes. Our 200% March Madness Free Play Bonus is intended for Recreational Players only. This promotion will be available for eligible deposits received between February 5th until March 21st, 2018. Our customers are required to contact our Customer Service Department in order to claim the March Madness Bonus. 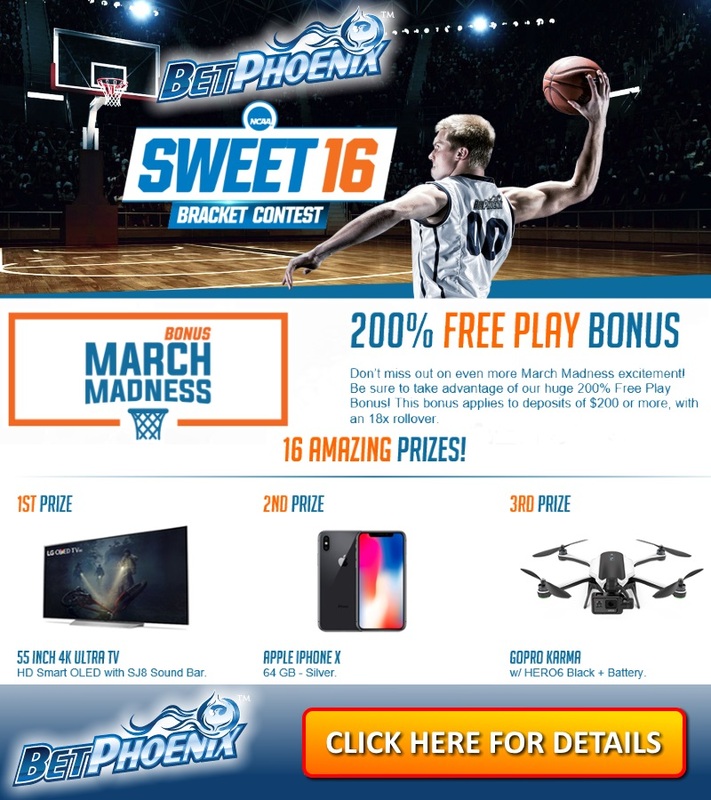 The minimum deposit amount required for the 200% March Madness Free Play Bonus is $200 USD. This promotion carries an 18 times rollover requirement, prior to withdrawal processing. This promotion carries a two-week hold prior to withdrawals. For the purpose of calculating the rollover requirement please make sure to add the free play amount won to the original deposit amount and multiply said figure 18 times. Casino action does not count towards the calculation of the rollover requirement. Please be aware, some deposit methods are not eligible for this promotion. For more information contact one of our friendly sales representatives.